It’s Sunday morning in Salt Lake City and The Legal Genealogist is wiped out. It’s the end of RootsTech week, and there isn’t much in genealogy that can wear you out more than trying to keep up with a mere 25,000 other people at the Salt Palace Convention Center for a week learning about what’s new. This week offered me a whole new challenge as I was invited to be one of the finalist judges in the 2016 Innovator Showdown — a competition among developers for new apps, new software, new products to aid the genealogical community. And today I want to introduce you to the Grand Prize winner of the Showdown — a Chicago start-up called TapGenes. Now… before the genetic genealogy community gets too excited … this is not — at least not yet — a replacement for 23andMe or raw-data-plus-Promethease. Yes, it is designed to be a place where family health information can be correlated — but not yet fully integrated with DNA results. Still, it’s an intriguing concept and it’s going to be very interesting to see where this newcomer ends up. 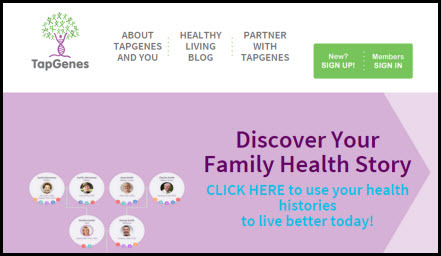 TapGenes helps you crowdsource your family’s health information, helping you understand the thread that ties your family’s health together. We’re referring to what makes you YOU…and how your entire family is connected. Not just physical traits and natural abilities, but valuable health information to preserve for future generations. In our digital age, we think paper seems so antiquated. So we’ve excelled at creating an easy-to-understand Family Health Tree where all that ‘runs in your family’ is recorded. And most importantly, preserved. Access this information whenever you need to – just think, your family history could be a mere tap away! Every family member who becomes part of your Family Health Tree gets an unparalleled Personal Health Portrait that can be accessed anywhere any time. Be prepared for life’s unexpected moments. Easily share health information with your family, doctor, school nurse, or babysitter. What’s the best benefit you ask? Having your family history on TapGenes not only allows you to safeguard it, but also share it if you choose. The company website goes on to say that: “Our mission is to help you understand the unique and personal connection between your family’s health, lifestyle, and the surrounding environment. Just how the DNA integration will work, how the security will be handled… well, those are issues to be fully developed as this start-up gets more than just getting started. But it really is an interesting concept, it fills a need, and it’s getting a boost from the genealogical community with the cash prize from the Innovator Showdown. It’ll be fascinating to watch what happens. I was disappointed that this is what won the jackpot. We’ve been down the health street before. I can’t see how this idea will tell you your health history. If you know enough to enter the information it will be just like ancestry’s health subscription. You enter the information and they turn it into a sentence and spit it back at you. It’s not telling you about your health history in a genetic sense; it’s gathering your family health history in one place. Am I the only person who is creeped out by the idea of one’s family’s health information being accesible and not necessarily well protected? Even if protected, medical insurance might require access and deny me health insurance because my second cousin has cited a family health issue that is expensive to treat. Prior to the ACA, one could be denied health insurance for any number of reasons, and Congress keeps voting to repeal the ACA. In a country where there was single payer not to be denied health insurance, it might still creep me out, as it could be used for racial/religious profiling of the Nazi variety. I love crowd sourcing as an idea, especially think that crowd-sourcing document transcription is nifty. Just not sure I’m ready for this application.